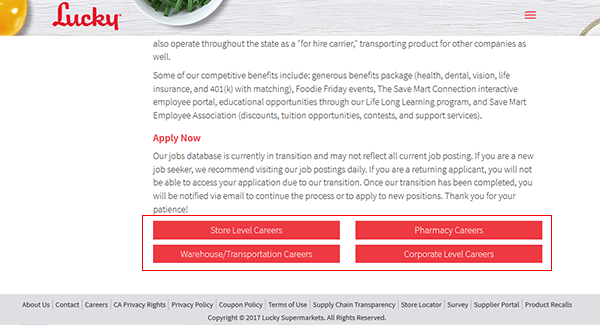 Use the links on this page to go to the company’s main careers site, where you will be able to apply for current openings by filling out and submitting the Lucky Supermarkets job application. Several different types of careers can be applied for including store level, pharmacy, warehouse/transportation, and corporate level positions. Learn more about the company’s job search/application processes in the below section. About the Company: Lucky Supermarkets is an American chain of grocery stores/supermarkets based out of Modesto, California. The company is a subsidiary of Save Mart Supermarkets and was created in 1935. Step 2 – Once you’re on the main careers page scroll down, and then click the link that corresponds to the type of career that you’re interested in (i.e. corporate, pharmacy, etc.). Note: These instructions provide an overview of the online hiring process for retail positions. Step 3 – Enter a keyword into the input field and then press the button as outlined below to load the results. Step 4 – Click the link of the job that you want to start the online hiring process for. Step 5 – Read the job summary and then click the button as shown in the below image. Step 6 – Sign in to your profile, or click the “Create a New Profile” link to go to the registration form.